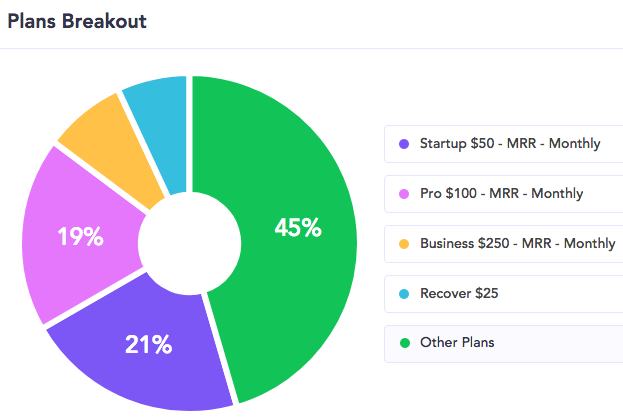 Pie graphs are similar to the Compare Plans feature in that you can see how the various plans stack up across different metrics. Unlike Compare Plans, we always include "Other Plans" in the pie chart. Nice! How do I use Compare Plans? When should I use Compare Plans? Break churn into a smaller problem and view it by plan. You may find that a particular plan is driving churn the most. You can try offering additional value to folks or potentially even eliminating that plan altogether. Introduce a new plan? Or want to see how an old standby is doing? See how each plan stacks up in terms of contributing to your revenue.